Last week hundreds of thousands of Americans took to the streets to protest what they saw as the evisceration of environmental legislation and a rollback of US efforts to stem the tide of climate change. Protests in Washington, Boston, New York, San Francisco, Chicago, Seattle and other American cities coincided with the culmination of President Donald Trump’s first 100 days. Over that period, most of the political victories that the new administration has notched have been around environmental and climate science — chiefly rolling back policies enacted by the previous Obama Administrations. As battle lines shift to the states from the federal government, local political realities and the new foundations of a profoundly changed US economy may reveal the limits of just how much power the current administration has to change the country’s course on climate issues. On the political front, a majority of adults in every congressional district across the United States support regulations like limits on carbon dioxide emissions from coal power plants, a 20% renewable power mandate for state utilities, and the regulation of carbon dioxide as a pollutant, according to a study from the Yale Program on Climate Communication. These utility commissions are tasked with controlling the rates that consumers pay for energy. It’s in their interest to keep prices low while ensuring that utilities are building enough new power generation to keep up with demand from homes and businesses. In recent years, price controls have come in the form of energy efficiency initiatives (the demand-side policies that Muro referenced), more natural gas power plants and renewable energy like wind and solar. Above all of this is a changing American economy that is weighted more heavily to lower emission industries like banking and financial services, computing, healthcare, retail and services, and telecommunications than on traditional manufacturing (it’s worth noting that automotive and oil and gas are still the largest industries in America). As the US economy becomes less energy intensive, a massive shift in pricing has made emissions-heavy coal power plants more expensive than other, more environmentally friendly options. “We don’t believe the renewable energy industry is exposed to the volatility of regulation or policies in the U.S. because of the competitiveness that has been reached through technological improvement, efficiency and performance,” says Antonio Cammisecra, head of business development at Enel Green Power. Still, conservatives in many states are moving forward with legislation to roll back clean energy friendly initiatives locally. While there’s a possibility that the removal of enough price obstacles could bring coal back into the range of competitive pricing with other power sources over the short term, Muro says, companies that have to invest in power are looking beyond a four-year (or even eight-year) horizon. And little of the coal that is extracted will make its way into the US grid, because the plants that turn that coal into power are shuttering across the country. Muro doesn’t expect that short-term price fluctuations will impact the decisions to build new coal plants. Beyond the lower prices that renewable energy and natural gas power enjoy, politicians in coal-friendly states would do well to note the overwhelming support that investment in new renewable technologies enjoy nationwide. 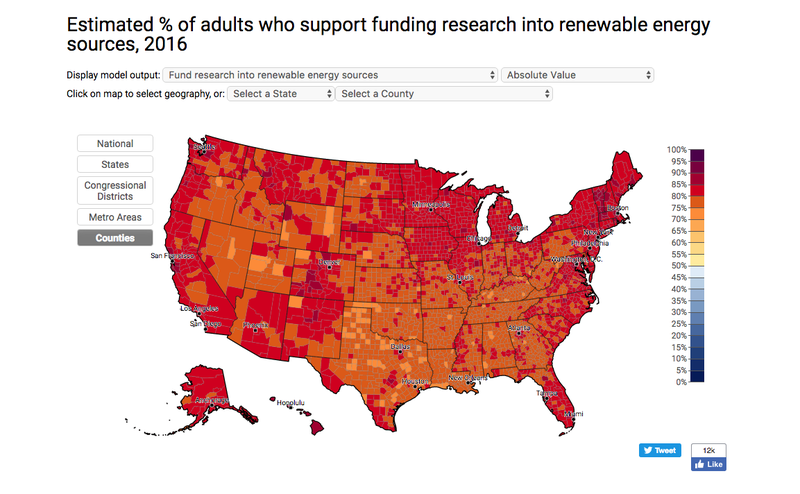 A new report from The Brookings Institute indicates that this local support may be critical since renewable energy patent claims (an indicator of new technological progress and potential economic growth) are declining nationwide. Those patents that are being filed — or innovations being made — are also being snatched up by foreign companies, the report indicates. As renewable energy and efficiency becomes an increasingly big business, Japanese, Chinese, and Korean companies are all in and trying to purchase this IP, Muro said. Indeed, renewable energy has produced more jobs in the power generation sector in recent years than oil, coal, and natural gas combined, according to a recent New York Times report. Manufacturing for components for renewable energy production is also, increasingly, a local game, according to the Enel executive, Cammisecra. “It must be said that most of the industry is local,” said Cammisecra. “Turbines are manufactured in the U.S., and other components are manufactured in the U.S. I don’t see what could drive a policymaker to hurt the industry in the U.S.,” by cutting renewable energy programs. The Trump Administration’s policies are being celebrated in some states, but in two of the most populous US states, climate change issues are top-of-mind. Because of the size and strength of their economies California and New York could very well set de facto policies for the nation. California has long been a leader in renewable energy policy, and any company looking to sell products and services in the state need to comply with what are the nation’s most rigorous environmental standards. This has already led to conflicts with previous administrations that didn’t share California’s environmental zeal. Thirteen other states have adopted California’s clean air standards (representing about one-third of the US auto market). So even if the broader national standards are rolled back under the Trump Administration, automakers may well decide to maintain their emissions reduction programs. Beyond policy and pricing, many US businesses are already taking climate change into account. At the Berkshire Hathaway annual shareholder meeting this weekend in Omaha, Warren Buffett once again reiterated his firm’s appetite for investment in renewable energy projects. “We have got a big appetite for wind or solar,” Buffett said Saturday at Berkshire Hathaway‘s annual shareholders meeting. Reducing energy and materials consumption also slashes manufacturing costs which is leading many companies to institute sustainable policies regardless of federal requirements. Wall street banks and big insurance companies are also pushing policies that encourage businesses to take their climate responses into account. The insurance industry is beginning to see losses rise from climate related events, and they’d like to encourage customers to do more to address those impacts. Meanwhile investment funds are beginning to drop fossil fuel stocks. A December report in the New York Times indicated that many big investors smell trouble in their traditional energy portfolios for a number of reasons.